Early in January 1945 – ten months before the signing of the United Nations Charter in San Francisco – Dr. D. F. Fleming, Professor of Political Science at Vanderbilt University, called a meeting in his office. Present at that meeting were Dr. Fleming, Dr. Hugh Stuntz, Fyke Farmer, Mesdames Andres Benedict, Dr. John Teague, David S. Bubis and Margaret Brandon. A committee was appointed to draft a constitution and a letter was sent out calling for a meeting. This meeting was held on January 17, in Alumni Hall, Vanderbilt University. Sixty-eight members were enrolled. By the end of the year, the chapter had 180 members, and, by the end of 1946, over 500 members. Originally known as the Nashville Chapter, the name was changed in 2009 to honor Cordell Hull, our native son, longest-serving Secretary-of-State, “Father of the United Nations” and Nobel Peace Laureate. The Chapter has been active since that time, and celebrated its 65th anniversary in 2010. There have been many important accomplishments of the Chapter over these years, through its activities in education, advocacy and promoting cooperation. The Chapter has also been honored by visits from a number of notable persons, including, for example, Mrs. Eleanor Roosevelt and Clark Eichelberger in 1958 and Ambassador Adlai Stevenson, in 1964. One of the Chapter’s highlights was the visit in 1976 by the then Secretary-General of the United Nations, Kurt Waldheim, his wife and the Permanent Representatives (Ambassadors) of all member States of the United Nations. The Nashville Chapter, in cooperation with The Honorable Ray Blanton, Governor of Tennessee, hosted the event, which, as stated by Governor Blanton, was “an act of friendship, hospitality and goodwill.” Regional chairpersons appointed by the Governor included Mayor Richard Fulton (Central Tennessee), Isaac Hayes (West Tennessee) and Ruth S. Holmberg (East Tennessee). General Chairman of the event was Edward G. Nelson, President of Commerce Union Bank. During the ceremonies, Governor Blanton, on behalf of the State of Tennessee, and Chancellor Alexander Heard, on behalf of Vanderbilt University, bestowed upon Secretary Kurt Waldheim the Cordell Hull Peace Award. This is an historic occasion. For the first time the Secretary General and the Permanent Representatives to the United Nations visit the capital of one of the fifty states of the United States of America. Through this meeting, the people of Tennessee acknowledge the common links of Americans with people throughout the world. And the men and women who have come here, representing the governments and peoples of their nations, affirm their common destiny with us. We live in an age in which our lives – indeed our hopes for peace, security and economic and social progress – have become increasingly intertwined. The United Nations is both a symbol of our interdependence and our most universal instrument for common progress. Through its work we seek worldwide cooperation on problems involving our security, world trade, food production energy, health, environment, use of the sea, transportation and communications. These problems transcend national boundaries. As a founding member of the United Nations more than 30 years ago, the United States remains firmly committed to the fundamental principles of the Charter – that peaceful cooperation should replace force and intimidation. We believe that with good will, patience, and mutual understanding, we can work with others to shape a more peaceful, prosperous and humane world – in which all nations and people have a stake. I would like to express my special admiration for Governor and Mrs. Blanton and for the people of Tennessee, whose hospitality and cooperation have made this historic visit possible. This is a welcome innovation in American diplomacy. 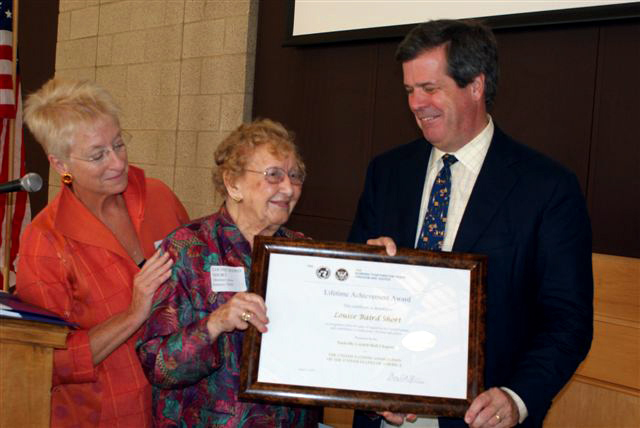 The Chapter presented one of the earliest members of the Chapter, Mrs. Louise Baird Short, with a Lifetime Achievement Award at the Summer Lunch in 2010, in recognition of her 65 years of support to the United Nations and contributions to world peace, freedom and justice. She was 104 years old at the time.